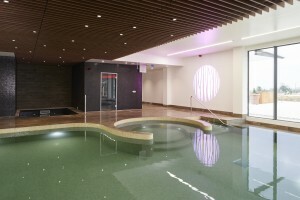 Aqua Platinum designed and built a luxurious high-end swimming pool and wellness complex for use by residents within a 350-block retirement home in Wiltshire. The intricate scheme includes a stunning indoor swimming pool with two infi nity edge corners to ensure the bathers can take in the dramatic views adjacent to the full-length glass. The complex also includes an integral spa within the pool, a standalone spa, a high quality steam room and bespoke sauna. A Heatstar XFEC6000 Super was selected for the environmental control, while the UV dosing is controlled by a Bayrol Pool Manager. The pumps and filters were supplied by Waterco and the lighting was supplied by Water-tec. “Throughout the design phase, the emphasis was on creating a paradise that the residents could relax comfortably in,” explains a spokesperson for Aqua Platinum Projects. The project was named overall winner in the Commercial Health & Wellness Project of the Year category at the recent UK Pool & Spa Awards. Aqua Platinum Projects also picked up a further four top awards in the competition, including Website of the Year, Residential Indoor Pool of the Year, Energy Efficiency Award and UK Team of the Year.